When you think of plumbing pipes, you probably think of transporting water to taps, washing machines, dishwashers and other water-using appliances. The truth is that plumbing pipes can carry many different types of liquid products, including sugar water, gas, cleaning chemicals, paint, soda and beer. An industrial piping system can be susceptible to both internal and external corrosion. These types of corrosion depend on the liquid that is flowing through them, and the external environmental factors. Internal corrosion can happen to any mental pipe anywhere. This often leads to internal pitting and cracks. 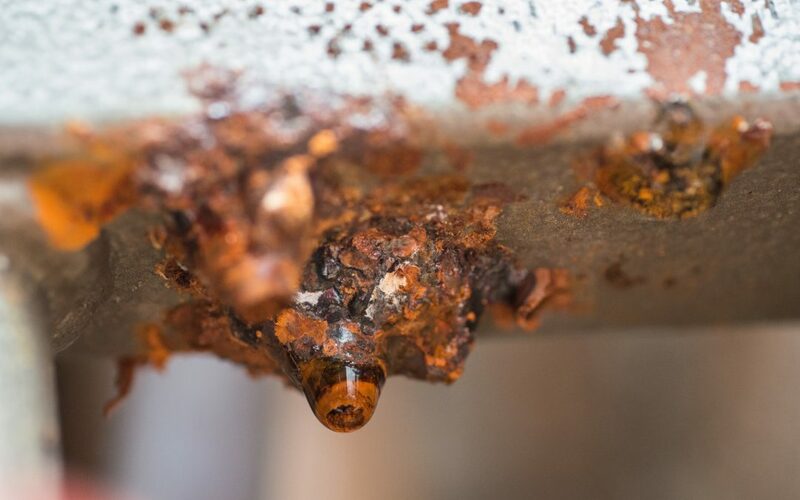 When internal corrosion happens, it’s generally due to acidic substances flowing through the pipes, including cleaning chemicals, beer, soda and even compounds containing sugar. However, internal corrosion can also happen due to the liquids having a high temperature and/or a high oxygen content. Internal corrosion is typically remedied by either replacing the pipes or by lining the insides of the pipes. When an acidic substance flows through a metal plumbing pipe, the acid starts to dissolve the metal. This causes pitting. If the pipe contains a lot of bends or weld seams, some of that acidic liquid can get caught in the crevices, leading to more pipe deterioration. In fact, it’s more common for a pipe to start leaking at a joint or seam rather than along a straight run of pipe. Heat causes corrosion, whether it’s hot water or another hot liquid substance. Heat causes metal to expand. When the metal cools, it contracts. Repeated hot and cold cycling of a metal plumbing pipe can cause internal cracks, which can compromise the structural integrity of the pipe, leading to leaks. 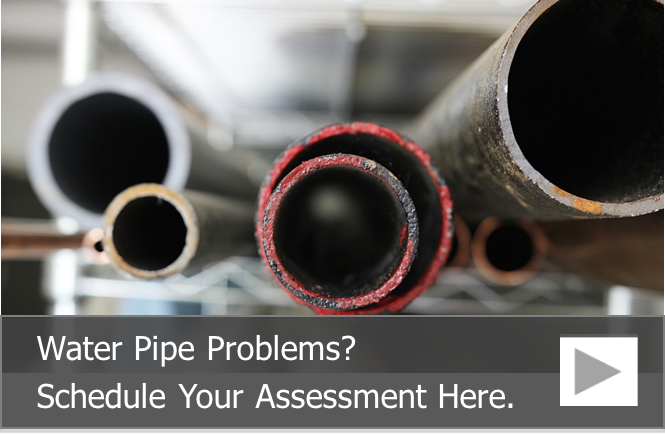 When a pipe is under constant high pressure, it can cause deterioration, especially along weld seams and joints. Plumbing pipes that have an increased pressure may include gas lines, steam lines and pipes carrying paint or other liquids that are meant to be sprayed. Over time, the increased pressure causes the pipe to form cracks or loosen at seams and joints, leading to leaks. External pipe corrosion occurs in areas with high humidity and/or a large concentration of salt in the air. This causes metal plumbing pipes to rust or corrode from the outside in. While this phenomenon is most common on the coast, it can happen anywhere under the right environmental conditions. Thankfully, painting the outside of the metal plumbing pipes helps prevent external corrosion. Internal pipe corrosion can wreak havoc for industrial processing plants and food manufacturing facilities, causing catastrophic pipe breaks and pipes that backup into various rooms in the building. Thankfully, pipe lining with Nu Flow can help stop corrosion and restore the functionality of your industrial piping system. Pipe lining involves putting either an epoxy soaked liner or epoxy resin inside the pipe to prevent the liquids from coming into contact with the metal. In the case of an epoxy liner, the liner is inserted into the pipe and inflated, then left to cure. Once it is cured, the liner is as hard as a new pipe, and fluids, like beer, soda and cleaning chemicals will not come into contact with the host pipe, which means no future corrosion. When an epoxy resin or coating is used, the coating is blown through the pipe, using air pressure. As the epoxy moves through the pipe, it coats the entire diameter. This also prevents liquids from coming into contact with the metal of the host pipe, and it fills and seals small holes and minor cracks to stop and prevent leaks. To learn more about the benefits of pile lining for your industrial or food manufacturing plant, contact us at 815-790-9000.